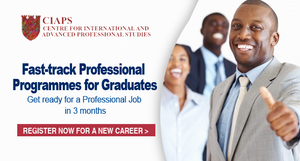 Lagos based International Graduate School CIAPS (The Centre for International Advanced and Professional Studies) has commenced registration for the October 2018 Special Professional Programmes for Graduates. The CIAPS Fast-track professional programme for graduates to commence on 19 October 2018. 2 Options of Study: You can study weekdays or weekend. Applicants for these courses are required to have a first degree or equivalent (Bachelors, HND). Having a good grade is a major advantage.